45th Birthday Favors. Buy a 1970 magnet to give as 45th party favors. Imagine handing out thse fun 45th birthday party favors to everyone at their tables. The dimensions of the magnets are 2.5" wide and 3.5" high. 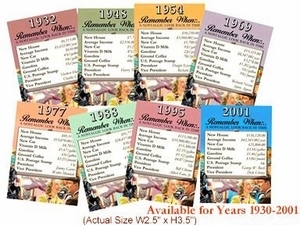 These 45th birthday party favors can even be used as 45th anniversary favors since they show 1970 stuff like prices and what a stamp cost you back then. Now you will know who the vice president from 1970 was and can impress your friends. The Cost displayed is per magnet. Be sure to see our other 45th gifts.